In 2018, the pace of life and business is quick. Attention spans are short. Technical communicators need to catch up. Long text passages, with occasional graphics, don't always reach a large part of our audiences. How can we create snappy visuals that enable people to learn what they need to learn quickly and painlessly? How do we simplify complex concepts, with far less words, and content that is truly engaging? 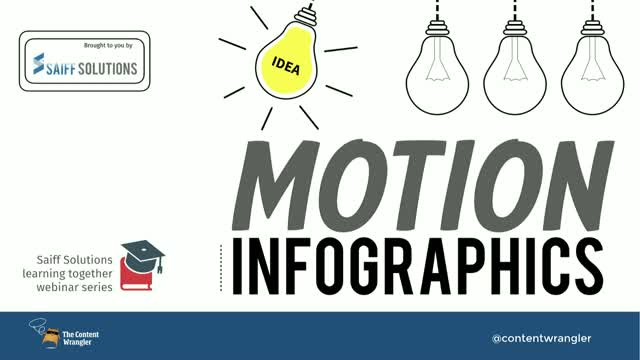 Motion infographics combine the best elements of minimalism, instructional design, and information architecture to produce content that people love. Join The Content Wrangler and Saiff Solutions for a discussion about infographics and their usefulness. We'll examine some examples of effective motion infographics, and hear from the creator of one of them. • What is so great about motion infographics? • What does it take to produce effective, engaging visual content? • What are the challenges?